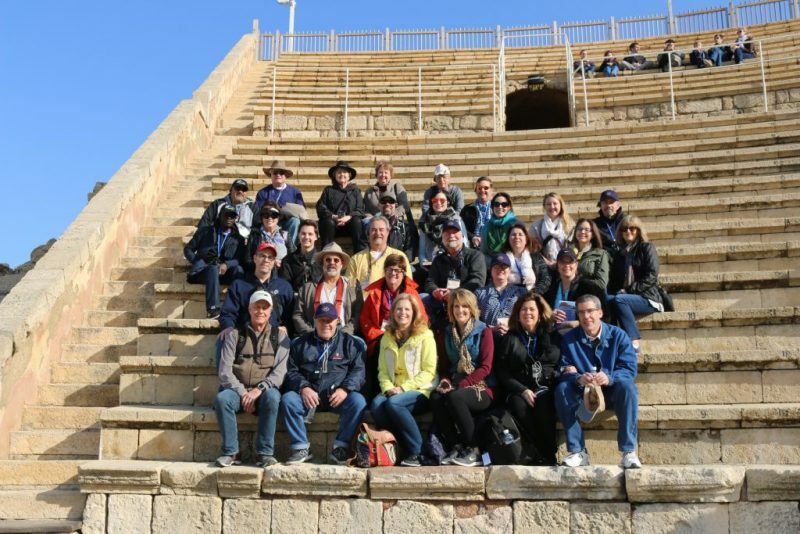 We’re back from our trip to Israel and Jordan. I have to tell you that it was a life-changing trip for all of us. You have to walk around Israel and Jordan with a Bible in one hand because so many of the events of the Bible took place right there in the land. I want to take a couple of weeks to share some of what we learned with all of you. Our very first stop was a seaside city called Caesarea. Caesarea is an ancient city that dates back to the 5th century B.C. The Romans had taken control of Caesarea in the year 6 A.D. and the city became the capital of the province of Judea for the next 500 years. It also became the headquarters for the Roman fighting forces stationed in Judea. The city really took off after the Roman Emperor Augustus gave the city to King Herod in 30 B.C. Herod was a master architect and his building projects in Caesarea were nothing short of spectacular. Two of Herod’s building projects that led to Caesarea becoming such an important city was the building of a huge harbor covering 40 acres and able to handle 300 ships and the building of aqueducts to bring fresh water into the city. Before the time of Herod Caesarea had no fresh water, but Herod solved the problem by building two aqueducts from the southern slopes of Mount Carmel into the city, a distance of ten miles. You can still see remains of the aqueducts today. With the huge harbor and beautiful city built by Herod, Caesarea became one of the most important cities on the coastal plains. Because of its magnificent harbor and flowing fresh water Caesarea grew into a large city made up of both Jews and Gentiles. This posed problems because the Jews were devoted to the exclusive worship of God while the Gentiles worshiped all kinds of pagan idols as well as the Emperor. The relationship of the Jews and Gentiles in Caesarea was tense to say the least. Around 66 A.D. the synagogue was desecrated and 20,000 Jews were massacred. This led to the First Jewish revolt which brought about the destruction of the Temple and the city of Jerusalem in 70 A.D. Titus, the Roman Emperor whose troops destroyed the Temple, sentenced 2,500 Jews to fight with wild beasts in the amphitheater in Caesarea as entertainment for his brother Domitian’s birthday. In the time that we have remaining today I want to introduce you to one of the soldiers who called Caesarea home. His name was Cornelius and he was a Gentile, a mortal enemy of the Jews. In Acts 10 we learn that Cornelius was a “centurion” in what was known as the “Italian Regiment.” A Roman legion was made up of 6,000 men, divided into ten cohorts of 600 men. There were sixty centurions in each Roman legion and Cornelius was one of the 60 commanders who had charge of 100 men. We also learn from our study of Acts 10 that Cornelius and his family were “devout and God-fearing, he gave generously to those in need, and he prayed to God regularly.” Let’s take a look at Acts 10:3-8 and see what happened to this Gentile soldier. Remember that Cornelius was a Gentile. A vile, pagan, dog of a man. That’s what the Jews called the Gentiles, dogs! In Acts 10 we run into this despised man and what do we learn about him? He had abandoned his pagan ways and he had devoted himself to the God of the Jews in the best way he knew how. He was a man of prayer. He feared God. He gave to those who were in need. He didn’t know the Hebrew Bible. He didn’t visit the Temple in Jerusalem. He was a Gentile. Yet if you look at his life I will assure you that he was living, as best as he knew how, for the glory of God. What was Cornelius doing when he had his vision of the angel of God? Acts 10:3 doesn’t specify. Luke simply tells us that it was about 3:00 pm when he had the vision. I will tell you that Cornelius was praying. You may ask, “How do you know that?” I’m so glad you asked. If you will turn with me to Acts 3:1 we can find the answer to our question. Three in the afternoon was the most important time of prayer for the Jews. Peter and John were heading to the temple to pray at 3 in the afternoon. Cornelius had stopped what he was doing to go to God in prayer at 3 in the afternoon. There is an important lesson for us to learn here my friends. We could spend several weeks studying the passages of God’s Word where people are praying and God moves, things happen. This shouldn’t surprise us because God has told us in Jeremiah 33:2-3. When God’s people pray God moves, He answers, He strengthens, He encourages, He comforts, He acts! 1 Thessalonians 5:17 says, “Pray continually!” Cornelius was praying when he had the vision to send some of his men to Joppa to get Simon Peter. Now Joppa is about 30 miles away from Caesarea so it took the men some time to get there. While Cornelius’ men were making their way to Joppa, Simon Peter was staying at the home of Simon the tanner who lived by the Mediterranean Sea. We read in verse 9 that Peter went up on the roof to pray. Isn’t it interesting? What was Peter doing on the roof of Simon’s house? He was praying. I don’t need to point out to you once again that God is at work when we pray. Peter wasn’t as excited about his vision as Cornelius was about his was he? Peter saw a sheet let down from heaven with all kinds of animals and birds in it, clean and unclean. Peter was hungry and God told him to take one of the animals, kill it, grill it, and eat it. Peter was a good Jew. He wouldn’t eat anything that wasn’t “kosher.” In Leviticus 11 and Leviticus 20:25-26 we find dietary laws and lists of what the Israelites could and couldn’t eat. God had given these to His people to separate them from the pagan people who lived in the land. Peter had never had a ham and cheese sandwich and he wasn’t about to start now. He was not going to violate the laws of God! What you eat or choose not to eat is a matter of preference, not law. Peter’s vision of the sheet with clean and unclean animals really wasn’t about Peter’s diet—it had a much greater significance. God was preparing him for a world-wide mission. We read in Acts 10:18, that while Peter was still pondering his vision, Cornelius’ men were were searching for Peter. I need to clarify something for us. It wasn’t that God was simply calling His people, the Jews, to distance themselves from other nations, He was calling His people to distance themselves from anyone who would entice them to serve other gods. Deuteronomy 30:16-18 teaches us about this. Read along with me. Peter went on to tell the Gentiles the story of Jesus from the time of John the Baptist preaching “Prepare ye the way of the Lord!” all the way through Jesus’ crucifixion and resurrection on the third day. Peter went on to tell the Gentiles that before Jesus’ ascension to the right hand of the Father He commanded His followers to preach the Good News to the people. Then something marvelous happened. Peter didn’t offer an altar call. He didn’t tell the Gentiles to bow their heads and search their hearts. He didn’t tell them they needed to get right with the Lord. He hadn’t even finished his sermon when we read in verse 44. God was working! God was working! Peter was obedient to what God had called him to do. Cornelius was obedient to what God had called him to do. But it was God who was working! We should never forget that my friends. We must be obedient to what God has called us to do. Forget about whether people think it is right or prudent or wise or beneficial; just be obedient to what God has called you to do. I can remember when we first came to this church—a white church in the middle of a predominately black neighborhood. I was a white pastor serving an aging, declining; some would have said “dying” white church in the middle of a predominately black neighborhood. I knew God was calling us to be something that we were not, something this church couldn’t even imagine. God was not calling Britton Christian Church to be a white church; He was calling this church to be a lighthouse of hope to all people. Britton Christian Church is not a white church, black church, brown church, red church, or yellow church—it is a lighthouse of hope for all people! This is what God has called us to be and it is His work! We must be obedient to what God has called us to do and be, but we must also know that it is His work! I’m so glad that Peter was obedient to God aren’t you? I’m so glad that Cornelius was obedient to God aren’t you? Because of the obedience of these two men, acting in accordance with God’s will, the very first Gentile was baptized in Caesarea! Cornelius was the first Gentile baptized, but how many millions more of us Gentiles have come to know Jesus since Cornelius was transformed from a God-fearer to a Jesus-follower? Not everyone was excited about what happened. In the very next chapter of Acts we read that Jews throughout Judea heard the rippling of the waters of Cornelius’ baptism. Read along with me from Acts 11:1-3. God has not called us to be pleasing to those around us—He has called us to be obedient. If you are going to be obedient to God then get ready—He will take you where you never thought you would go, He will give you tasks you could never have seen yourself doing, and He will use you like you never dreamed you could be used. God’s plan are much bigger than ours my friend. I was reminded of that while I was in Israel and Jordan. Because of the information we are fed through the media, most Americans think of Palestinians as terrorist. We see news reports, we watch video coming in through our televisions, and we draw our conclusions. I want you to know that God loves the Palestinian people and He is working in their communities in the West Bank and the Gaza Strip. We went to Bethlehem, in the West Bank, one day while we were in Israel. It’s not advised, but I wanted our people to have their eyes opened to what God is doing. There in Bethlehem we met a woman named Iman who loves Jesus and has graduated from Bible College. She led us on a tour of the Church of the Nativity and shared her faith with us. We met a Palestinian business owner name John. John and his employees make the most beautiful hand carved figures out of olive wood. While he was showing us his factory he told us that a couple of years ago he cut his production by 40% so he could help other believers who also carve figurines out of olive wood. Life is hard in the West Bank and these home-based businesses are struggling to make it. John cut production so he could buy their products and sell them through his store. I said, “Wait a minute. I need to make sure I understand you. You cut your production by 40% to help your competitors?” John said, “No, I didn’t cut my production to help my competitors. They are not my competitors, they are my community.” God is at work my friends. Never doubt His work. Enlarge your vision of His ability and willingness to reach out to those you might categorize as the least likely to come to know Jesus. There may be someone here this morning, or someone reading this lesson who has doubted God or rejected God throughout your life. I want you to know that He loves you more than you can ever imagine. Won’t you surrender your life to Him this morning?